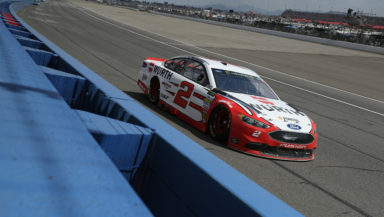 The day for Brad Keselowski started with a spin through the frontstretch grass, then ended with a second-place finish at Auto Club Speedway. On the initial start, Denny Hamlin spun the tires and forced Keselowski off the gas. The resulting accordion effect led to the front bumper of Ryan Newman, who turned Keselowski up the track. It left him with a damaged left-rear corner panel. Exiting Turn 4 on the third lap, Keselowski got loose trying not to hit Ty Dillon, and was tapped in his left-rear by Jimmie Johnson, and spun down the track and through the frontstretch grass, bringing out the first caution of the race. With his damaged race car, he fought his way back into the top-10 just past halfway through the race and was in the top-five when the final caution flew with three laps to go. Keselowski restarted third on the overtime restart and passed Hamlin to finish second.